What attachment style are you? It says a lot about the quality of your relationship…and your happiness in life! Have you ever wondered why some couples just can’t seem to get along? Why do they have so much conflict? Why is one partner seeking intimacy and closeness while the other avoids and distances? The answer lies in the nature and quality of their attachment bond, that is, the level of emotional and physical safety the couple have with each other. In other words TRUST. Prominent relationship researcher, John Gottman, in his latest book, “The Science of Trust: Emotional Attunement for Couples,” has found that trust is the most important factor in relationships. To make sense of this we must understand how we’ve evolved as a species. For most of our 150,000 years on the planet, homo sapiens have been hunted by predators and have lived in very perilous conditions. It’s only been in the last 10 – 12,000 years that we’ve had civilization and being “hunted” has lessened. Prior to this we survived by living in small hunter-gatherer tribes of 20 – 30 people. WE HAD TO DEPEND ON EACH OTHER FOR SURVIVAL. It was extremely dangerous or even fatal to be on your own. Therefore, the need to be close and connected to others, particularly in intimate relationships, is essential to our survival, and indeed, our happiness. If we don’t feel close and connected to our partner we experience distress and unhappiness. Conflict, drama, withdrawal, etc. are all related to anxious and avoidant attachment styles. If you’re not happy in your relationship, I suggest you take a look at what’s happening from an attachment perspective. Try and identify your own and your partner’s attachment style. A great book I recommend for this is “Attached,” by Levine & Heller. Secure. Comfortable with closeness, vulnerability and emotional intimacy. Anxious. Preoccupied with the relationship, always seeking closeness and connection. Often described as “needy,” clingy, etc. Avoidant. Uncomfortable with closeness, independent, needs lots of “alone time.” Always seeking strategies to avoid vulnerability and closeness. Often described as aloof, distant, cold, “one foot in, one foot out,” etc. Here’s a graphic that illustrates this. 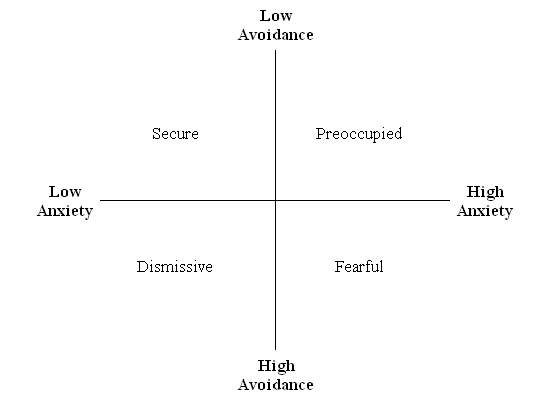 Note that there are 2 avoidant styles – dismissive and fearful. The foundation of a lasting and happy relationship is having a secure attachment base with your partner. Most, if not ALL, conflict and “drama” is related to one or both partners exhibiting anxious and/or avoidant attachment style behaviours. The good news is that IT CAN BE FIXED! Once couples understand these patterns, the tools needed to create a secure attachment bond are pretty straight forward. The goal is to create safety and trust by being more emotionally open and connected. We can all do this!